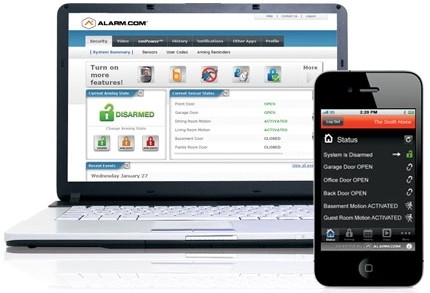 No matter where you are, Global Interactive Service, powered by alarm.com keeps you close to your home and business. In addition to our 24/7 UL Central Station Monitoring, you can view system status, monitor activity at your property, watch live and recorded video, arm and disarm your system, set up user codes, and even control your lights and thermostat - all from easy-to-use web and mobile interfaces. Our proven technology platform works wirelessly, utilizing a GSM cellular network to maintain a dedicated and secure connection to your home and business security system - no wires, no hassles. Plus, Global Security offers the benefit of industry-leading 2-way voice technology to keep you safe in the event of an emergency. Our dedicated wireless signaling provides complete protection, even if an intruder cuts the phone line or disables the power and our patented crash & Smash protection ensures that a signal will still be sent to the central monitoring station if your security control panel is damaged or destroyed in an intrusion - you can rest assured you'll stay protected. Global Security Systems Interactive Services, powered by alarm.com works wirelessly with your security system to give you instant access to what's happening when you're not there. With Global Security, you can stay aware of all activity that occurs at your home or business, not just alarms. With Global Interactive Service, powered by alarm.com you can set up real-time text and email alerts to find out about any type of system activity that matters to you. You can keep track of activity on entry doors, windows, liquor and medicine cabinets, safes, drawers, and more. With free apps from Global Security Systems, powered by alarm.com you can take your security system with you while on the go. Using your blackberry, iphone, Android or other mobile device, you can connect to your home security system, control it, and protect what matters most. Global Security video, powered by alarm.com lets you see what's going on from any web-enabled computer or mobile device. Use cameras inside to check up on kids, pets and visitors, or point them outside to see activity on or around your property.